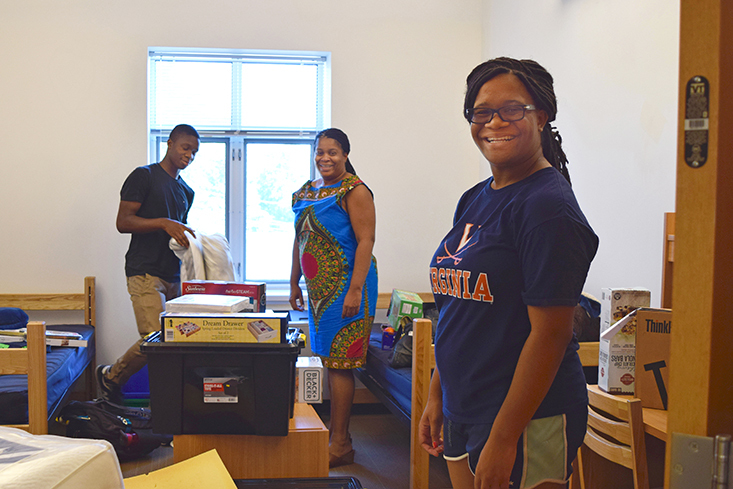 Move-In Times & Locations | Housing and Residence Life, U.Va. Students receive correspondence directly from Housing & Residence Life about housing assignments and move-in dates. The information below can help you begin to plan. Please note, University ID cards are picked up at the ID Office in Observatory Hill Dining Hall, not at Housing & Residence Life. Move-In for first-year students will occur on either Friday, August 24 or Saturday, August 25, depending on your room assignment. You receive your move-in date and location when you receive your room assignment in July. Early arrivals are only permitted in special circumstances (see "Undergraduate Early Arrivals" below for more information). In order to help manage traffic flow and greeter resources on move-in days, Housing & Residence Life has established two-hour move-in time slots. These windows specify your arrival time, and are assigned to you based on your housing assignment. Roommates should coordinate with each other to stagger arrival times during the assigned window. Kellogg: Friday, August 24 from 9:00 to 11:00 a.m.
Gibbons: Friday, August 24 from 9:00 to 11:30 a.m.
Tuttle-Dunnington, Watson-Webb: Friday, August 24 from 11:00 a.m. to 1:00 p.m.
Woody: Friday, August 24 from 1:00 to 3:00 p.m.
Cauthen, Lile-Maupin: Saturday, August 25 from 8:00 to 10:00 a.m.
Balz-Dobie: Saturday, August 25 from 10:00 a.m. to 12:00 p.m.
Courtenay: Friday, August 24 from 9:00 to 11:00 a.m.
Dunglison: Friday, August 24 from 11:00 a.m. to 1:00 p.m.
Fitzhugh: Saturday, August 25 from 8:00 to 10:00 a.m.
All buildings (Davis, Gildersleeve, Harrison, Holmes, Long, Mallet, McGuffey, Peters, Rogers, Smith, Tucker, Venable): Saturday, August 25 from 8:00 to 10:00 a.m.
141-148, 149, 249, 341-348, 349, 350: Friday, August 24 from 9:00 to 11:00 a.m.
131-140, 331-340: Friday, August 24 from 1:00 p.m. to 3:00 p.m.
153-158, 159, 160, 351-358, 359, 360: Saturday, August 25 from 8:00 to 10:00 a.m.
111-120, 311-320: Friday, August 24 from 11:00 a.m. to 1:00 p.m.
103-106, 110, 201, 210, 301-306, 307-310: Saturday, August 25 from 10:00 a.m. to 12:00 p.m.
Gwathmey, Hoxton, Munford, Yen: Saturday, August 25 from 10:00 a.m. to 12:00 p.m.
Malone: Saturday, August 25 from 8:00 to 10:00 a.m.
Weedon: Saturday, August 25 from 10:00 a.m. to 12:00 p.m.
Bonnycastle: Friday, August 24 from 9:00 to 11:00 a.m.
Metcalf: Friday, August 24 from 11:00 a.m. to 1:00 p.m.
Kent: Friday, August 24 from 1:00 to 3:00 p.m.
Hancock: Saturday, August 25 from 8:00 to 10:00 a.m.
Dabney: Saturday, August 25 from 10:00 a.m. to 12:00 p.m.
* The 12:00 noon time slot on Saturday is three hours long to permit attendance at the 1:00 p.m. President's Address. You will be able to temporarily unload your car relatively close to your building. Look for signs directing you to your area once you arrive on Grounds. You will have 15 minutes to unload your belongings. A driver must stay with the car at all times. It is important that you then move your car to longer-term parking at the Emmet/Ivy Garage (Friday) or Stadium (Saturday) as quickly as you can. Moving your car will help with the traffic flow on Grounds and in the local community. Unless approved for an early arrival, all students in upperclass housing may move in on Friday, August 24 between 9:00 a.m. and 4:00 p.m. or on Saturday, August 25 between 8:00 a.m. and 5:00 p.m. If you wish to be considered for check-in before August 24, see "Undergraduate Early Arrivals" below. You will be able to temporarily unload your car relatively close to your building. Look for signs directing you to your area once you arrive on Grounds. Bice residents should note that short-term parking in the lot immediately adjacent to the building will be limited. In all areas, it is important that you move your car to longer-term parking at the Emmet/Ivy Garage (Friday) or Stadium (Saturday) as quickly as you can after unloading belongings. Moving your car will help with the traffic flow on Grounds and in the local community. If you are part of a University group that requires your presence on Grounds before Opening (such as an athletic team or Session K Orientation), your program leader will contact Housing & Residence Life to coordinate approval for early arrivals. Students not part of a sponsored group need to submit an Early Arrival Application, available in July. Not all early arrival requests will be approved. We recommend incoming first-year and transfer students arrive in time to participate in the mandatory Wahoo Welcome events on Friday and Saturday. Returning students may arrive later, if they choose. Check in at the Housing & Residence Life Main Office in Gibbons House from 8:00 a.m. until 5:00 p.m.
Students arriving on or after Tuesday, August 28 must inform Housing & Residence Life in order to keep their housing assignment. If you enroll at the University but fail to check into your assigned residence, you are still responsible for payment of housing charges for the entire academic year. Your move-in date is specified on your housing agreement. Keys can be picked up at the Housing & Residence Life Main Office during business hours: Monday - Friday (except holidays), 8:00 a.m. to 5:00 p.m. Please see your room assignment and our Graduate Housing FAQ or Faculty/Staff Housing FAQ for other important move-in information.